To celebrate the launch of Serial Killer Z, I’ve got a bit of a zombie theme going on for this month and I’ve lined up a series of interviews with a few zombie authors. 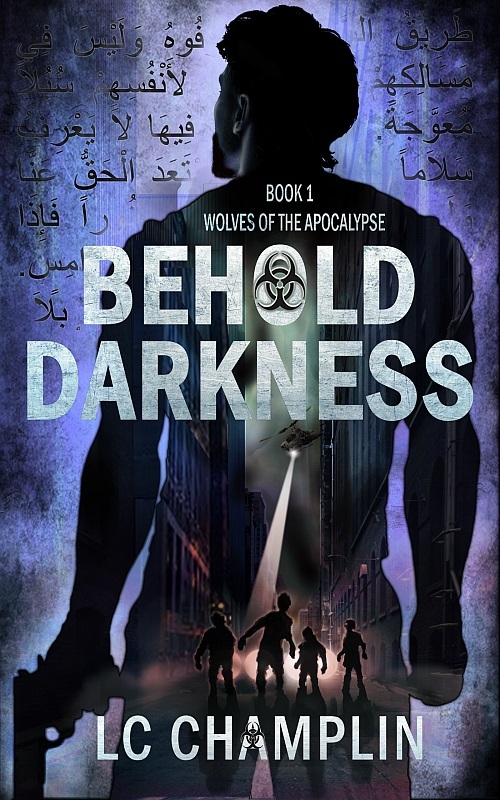 Today, I’m talking to LC Champlin, author of the first book in the Wolves of the Apocalypse series, Behold Darkness. I started writing when I was old enough to hold a crayon. I’m just as excited about my stories now as back then, but I use multi-syllable words and a word processor now. I write fiction because the characters in my head have too much attitude to stay in my skull, I want to see the world through different eyes, and I need to live life through different souls. My stories are dark and snarky with plenty of action. But don’t think you’re in for a mental junk-food read. The characters force you to answer difficult questions as they negotiate the zompocalypse. On a trip to San Francisco, New York businessman Nathan Serebus and his attorney Albin Conrad match wits with the mastermind of a multi-target terrorist attack who unleashes a plague that turns people into mindless cannibals. But the out-of-towners are up to the challenge. Their motto: buy when there’s blood in the streets. It’s going to be an interesting night. I write about zombie – or cannibals, ghouls, zeds, walkers, etc. – because it’s in the dark that we see a person’s true character. Don’t you wonder how you’d respond if everyone suddenly became a mindless monster bent on eating you? Plus, who doesn’t like shooting zombies! There are a lot of factors. First, we fear plagues. It’s instinctive. Second, we fear losing control of our actions. (Can you imagine killing your loved ones and not being able to stop yourself?) Combine the two and you have the basic premise behind zombies. Paradoxically, humans handle fear by exploring it. It’s why haunted houses are so popular – and so fun. In today’s society, people already act a lot like zombies: glued to their mobile devices, doing what media and leaders tell them, wandering through life with no purpose but to consume the next popular commodity. A lot of us want to break out of that mold. We want to be the survivors that triumph over the hordes of mindless shamblers. Zombies give us the chance to experience our fantasy without going nuts! What’s your favourite zombie videogame? Resident Evil! This franchise really fueled my love of zombies and their ilk. One of the main villains, Albert Wesker, was a major influence when I created my secondary protagonist. The idea of a secret multi-national corporation running the show is also a big element in my stories. There are many naturally occurring organisms that hijack their host’s body and behavior. Look at Cordyceps, the fungus that eats insects. Another fungus, Eryniopsis lampyridarum, entices soldier beetles to mate with the (dead) host and thus contract the fungus. The Toxoplasma gondii parasite affects monkey amygdalas, decreasing their ability to feel fear. Combine the existence of these organisms with mankind’s incredible ability to alter life forms’ DNA and to inflict suffering on its fellows, and I think the most likely cause would be a modified parasite or fungus. 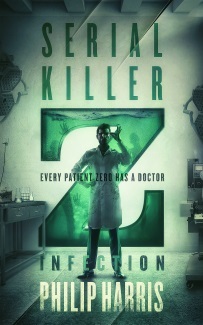 Creating a zombie plague would also open a massive market for cures, treatments, and defenses. Throw in the emerging technology of nano machines, and you’ve got a recipe for the zompoc! Fast! What’s so scary about a zombie you can out-walk? What authors have inspired you zombie writing? Hitting the high points, there’s Greg Weisman, who created the stellar 1990s series Gargoyles; Kouta Hirano, creator of the manga Hellsing about gun-slinging vampires; Jay Bonansinga and Robert Kirkman, creators of The Walking Dead; Margaret Weis and Tracy Hickman, who wrote Dragonlance, the first fantasy book series I read; JK Rowling, creator of amazing plots; JRR Tolkien, creator of some of the most terrifying villains around; and so many more! What do you think about stories that offer a cure for the zombie state? I like the idea of fixing the problem. There are too many zombie stories that never try to remedy their situation. If there’s a cure, a new problem comes into play: guilt. People killed zombies left and right, thinking they were taking out non-humans. But if there’s a cure, that means you killed people who were just sick. Some people will realize you gotta kill or be killed, but many others will have horrible guilt. That said, I also like the idea of there not being a solution. For most Westerners, mistakes in life have few consequences that can’t be mitigated. But zombies? If there’s no cure, one error can kill you and others. I fill my time with reading widely, writing as much as possible, hiking in the Blue Ridge Mountains of Georgia, and paying the bills with my day job.